When emergency medical care is needed, faster is always better, especially when that emergency is cardiac arrest. Urgent care, within minutes of a cardiac episode, can literally amount to a difference between life and death. To help improve the odds for those who may suffer from sudden and serious heart problems, scientists are examining the use of defibrillator-carrying drones that are capable of providing an even more rapid response than current emergency care resources. 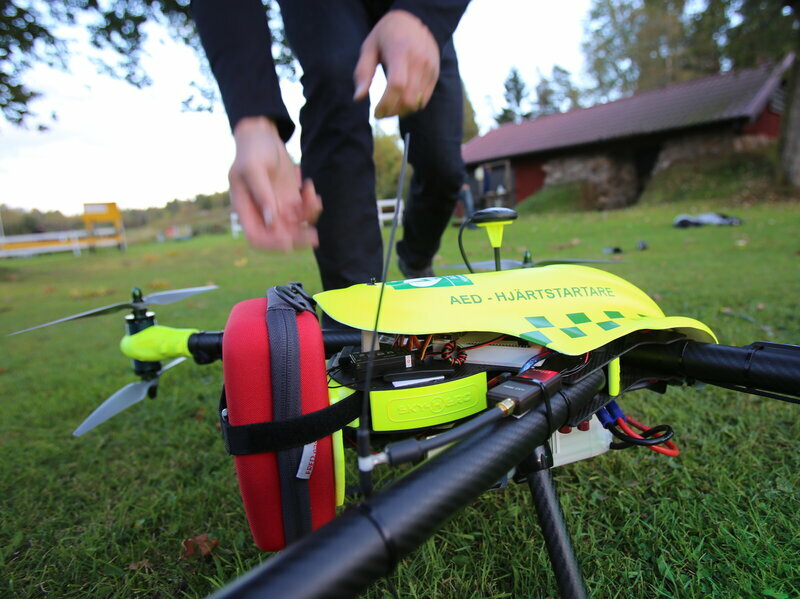 Developed by the Swedish Transportation Agency, a small, eight-rotor drone is able to carry a compact automated external defibrillator (AED). The combination comes in at under fifteen pounds and can travel as fast as 47 MPH. After being housed in a fire station near Stockholm, the drone was tested over a 72-hour period and dispatched 18 times. Operated by two pilots using GPS coordinates, the drone was able to reach out-of-sight areas with impressive speed. On average, dispatching the drone took just three seconds, while conventional emergency services took three minutes. The drone then arrived on the scene in well under six minutes—16 minutes ahead of the emergency services. While this particular study only included a small number of cases, with flights dispatched over a short distance and in fair weather, researchers are confident the drones will have a regular role to play in future emergency response to cardiac arrest. The defibrillators are said to be easy to operate for bystanders, with some basic coaching from dispatchers, and can significantly improve the odds of survival when someone suffers cardiac arrest. What are your thoughts on this use of drones in an emergency medical situation? Comment and let us know.